[social_warfare buttons=”Facebook, Twitter, Pinterest”]One of the beauties of Housesitting is that you get to live in a place and integrate into the community, making new friends and joining in on events, but also the opportunity to give back. 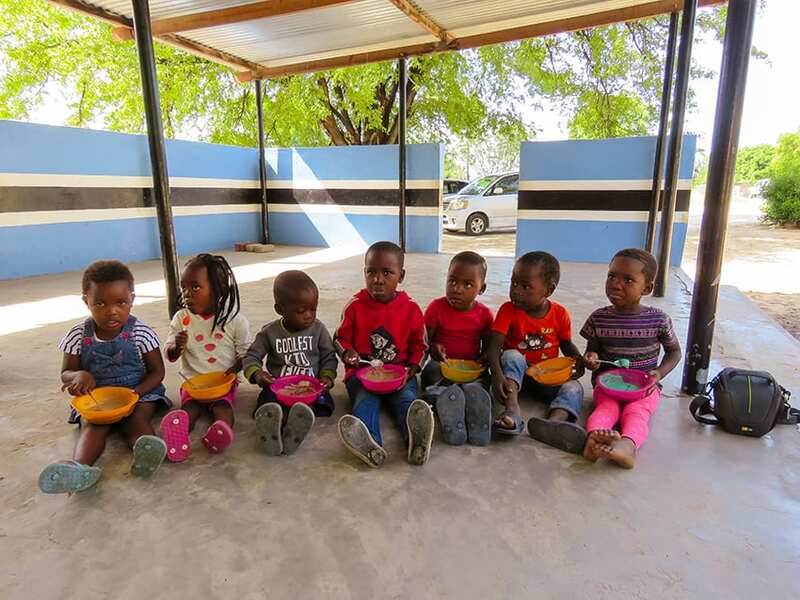 During our recent month in Botswana, a chance meeting with Theresa and Lorraine, two of the helpers at Feed a Child Maun, a Maun based non-profit organisation, led to us joining them to give breakfast to some of the underprivileged children in the area. Sitting quietly in a row patiently waiting for their breakfast, the rag-tag bunch of kids melted my heart. They glanced shyly at us, their big brown eyes following the two white newcomers as we helped mix their porridge. 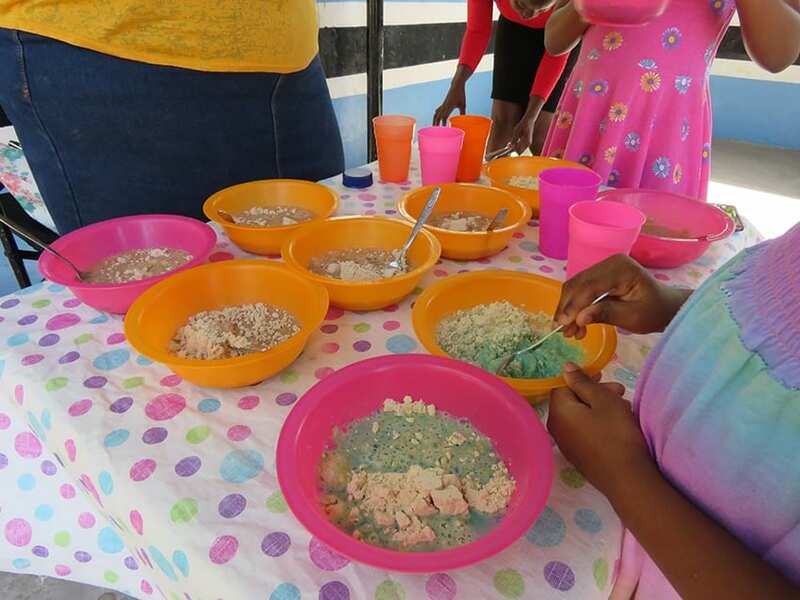 Every weekday morning Lorraine, Theresa and other helpers at Feed a Child Maun provides a valuable meal for children whose parents are on low or no wages in Tshutshubega settlement, Kgosing and Boyei wards. Each bowl of fortified porridge provides sufficient daily nutritional needs for the children. On Fridays, the children take away enough porridge be fed over the weekend. This might be the only meal some of the children get. After saying grace, the children eagerly tuck into their meal, scraping the plates clean. Once everyone is finished and faces are cleaned, it is time for play! We joined in with their games and after teaching them “Head, Shoulders, Knees and Toes”, we played one of their games of trains, before it was time to say goodbye to the children. After that first meeting, I wanted to find out more about Feed a Child and how I could help support them. 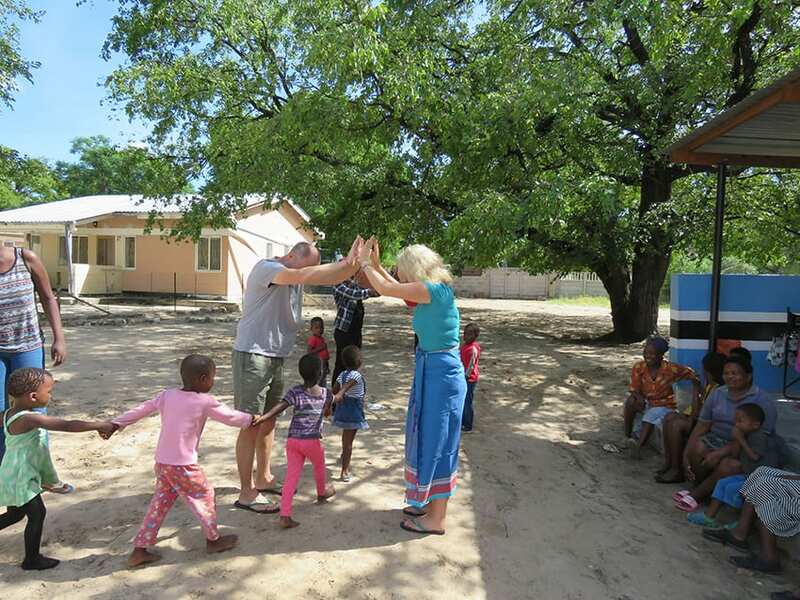 I had the privilege to meet Julia Pelser, a softly spoken South African who has been supporting the children since she moved to Maun with Daniel, her late husband, in September 2012. For Julia, feeding undernourished children has now become a lifetime passion and commitment. Although softly spoken, Julia’s energy and determination to feed undernourished children in every ward in Maun is immense. She also intends extending it to include providing meals for pregnant mothers, so that babies get the best possible start in life. She told me that for children to qualify to be fed, they must be under the age of five, identified as undernourished by the health clinic or to be registered as destitute or orphaned. With the help of Feed a Child, by the time the children are of school age, they are much stronger and do not start school disadvantaged. 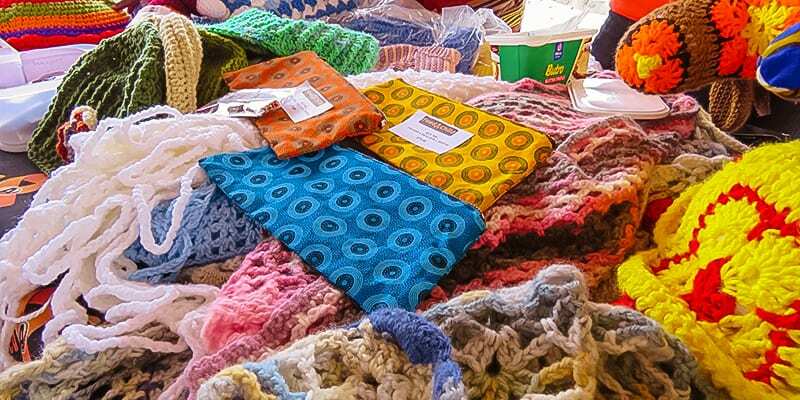 Not content to just feed the children, Julia and her team are also helping the communities by teaching the women to make bracelets, reed straws and to learn crochet. These skills can help the women earn a living by selling their products. It cost just 3 Pula – the equivalent of 22p – for each meal and Feed a Child is dependent on donations. When there has been a shortage of funds, Julia has been known to take from her own pocket because of her commitment to feeding the children. A recent donation of 50,000 pula from Mascom, a mobile phone provider in Botswana, has gone some way to helping. If you would like to help, please make a donation to PayPal, please click here. It doesn’t matter how small, remember £1.00 will feed a child for nearly 5 days! 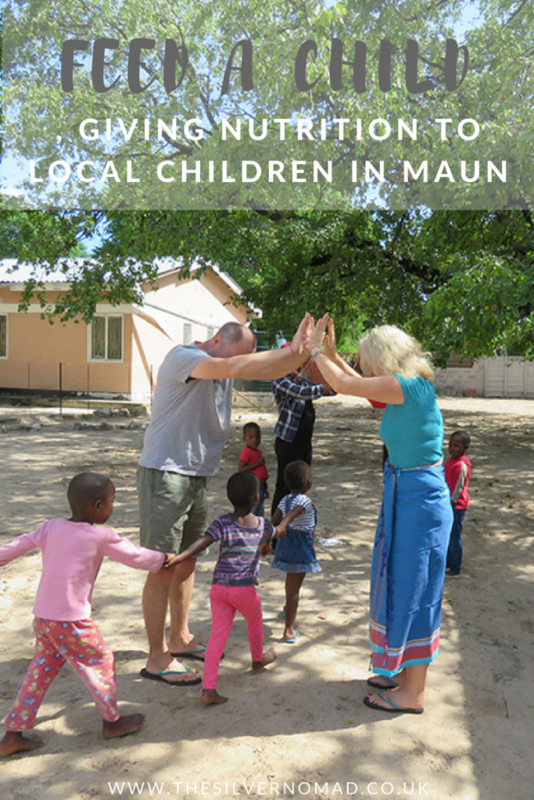 I would like to raise at least £1,500 by March 2019 when we hope to return to Maun. This will be enough to feed 20 children for a whole year. From 1 August 2018 to 14 October 2018, I am going to attempt to go without chocolate! Quite a tough job for me, but for each day I go without, I will personally donate £1.00. So potentially 340 meals if I can resist for the whole 75 days! I will keep the total updated on Facebook and Twitter! To learn more, you can read the Feed A Child Brochure here. ← The Taj Mahal – top 12 tips to make your visit awesome!